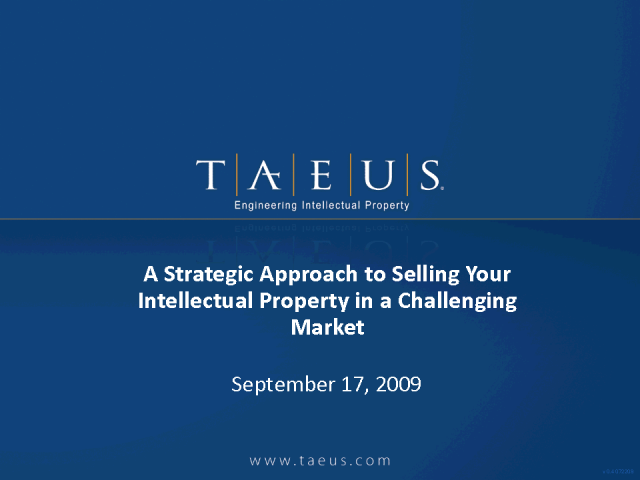 For nearly twenty years, TAEUS International Corporation has helped market leaders around the world maximize the value of their intellectual property through comprehensive intellectual property business-cycle solutions. Organizations such as Samsung, IBM, Renesas, Nokia, Qualcomm and the European Commission have turned to TAEUS to help them maximize shareholder value in mergers, acquisitions and other corporate transactions as well as gain a competitive advantage in the marketplace through the strategic application of their unique intellectual property. Mr. Willis has extensive experience with the legal, economic and scientific or engineering aspects of the due diligence process. His expertise encompasses valuation and pricing, the management of IP and expert testimony. He has also negotiated and participated in the economic aspects of technology transfer and IP brokering transactions. Mr. Nault manages Intellectual Property engineering projects for clients located in Japan, Korea, and Taiwan. He has managed worldwide product development teams and managed new-product startups in a variety of commercial settings. Mr. Troyer develops and manages a suite of software applications for TAEUS including the Global Patent Syndicate (GPS), IPortalware (turnkey patent marketing portal), IP Analytics tools including TAEUSreports and Keyhole (semantic analytics), and an online patent review framework called TAEUSworks.